One of the most common running questions my fiance Gabe asks me "when can I buy new shoes". I always think about how many miles you should run in shoes and what month we bought them before I respond. Since math was never my positive strength, this mental exercise usually takes a few minutes before an answer is given. That will be a problem no more. I was asked to check out a new product for running shoes called Mino. The creators of Mino is a start up tech company located in the US. The mino is a small sensor device which is placed under the sock liner of your shoes. It automatically tracks the age of your shoes while you are running, alerting you when you hit 400 miles which will avoid injury from worn out running shoes. I placed the mino in my Mizuno Wave Sayonaras which I received in June. I switch up shoes a lot based on distance and these have the least amount of miles ran on them. When you press the blue button on the mino, you will have one of 6 lights appear. One of the 4 blue lights means you are in the good zone. A yellow light means you've hit 350 miles and should should start shopping for new shoes. And the red light which means you have hit the 400 mile mark. When I took my first few steps, I could feel the Mino mile sensor in my shoe. It's only 2mm and my Mizuno's are 10mm. After 2.5 miles of interval training, I honestly forgot it was there. I ran 6 miles yesterday with the Mino and didn't feel it or think about it once. 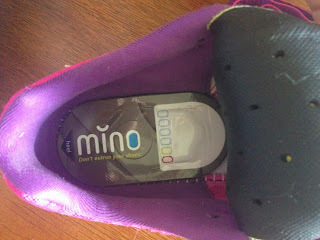 I think the Mino is a genius invention for those who put a lot of miles into a pair of shoes. It's time for Gabe to get replacement shoes and he will be running with a Mino. Now it's time for the giveaway! The nice people at Mino are giving away Mino mileage sensors to THREE of my lucky readers! Let me know in the comment field below how many miles you put on your sneakers before retiring them. Also, be sure to log your entries in the rafflecopter widget below as that is how I randomly select a winner. Once you comment, you will have an opportunity to gain additional entries. Note: This was a sponsored post by Mino. As always, all opinions are my own. I retire them around 500 or so depending on what type of miles I put on and the tread. HA. I WAY over-ran my last pair of sneakers by probably about 100 miles. I got a new pair literally two days ago. I could definitely use this little gadget. I'm not sure. I change them when the bottoms seem to be wearing down or my feet hurt. I aim for 400-500 but honestly am not so sure - I've been much better recently about logging all runs so I know! I never really know. When my shoes start feeling flat, its time for new ones. This would be great! I go about 3-6 months (normally about 500 miles) or until something starts to ache. I usually go through them every 3 months, but since I've been getting my miles in the gym lately, I've been noticing they're not wearing out quite as quick. I always know it's time to get a new pair when they're flat or my knees start to hurt though.